The drive along the S52 is one of those highly recommended drives. It takes you to a number of viewpoints one of which is at the Red Rocks site. 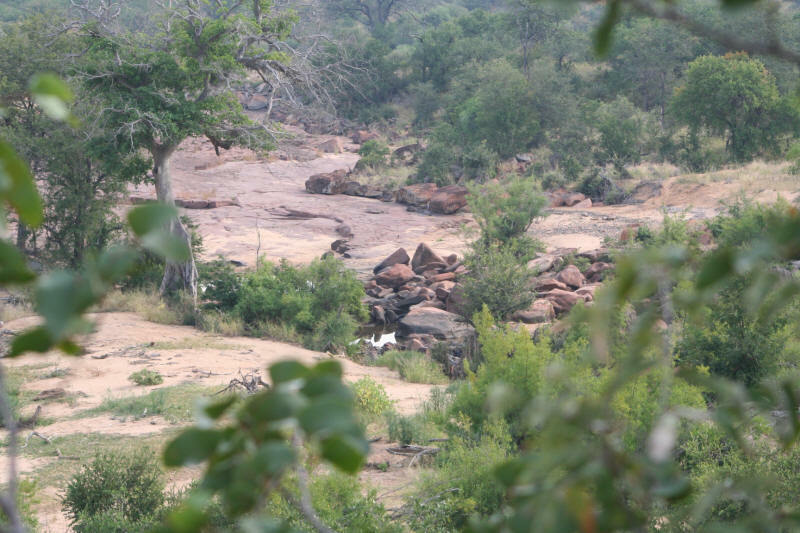 Red Rocks refers to a large sandstone slab exposed by the Shingwedzi River about 15 kms south west of the camp. 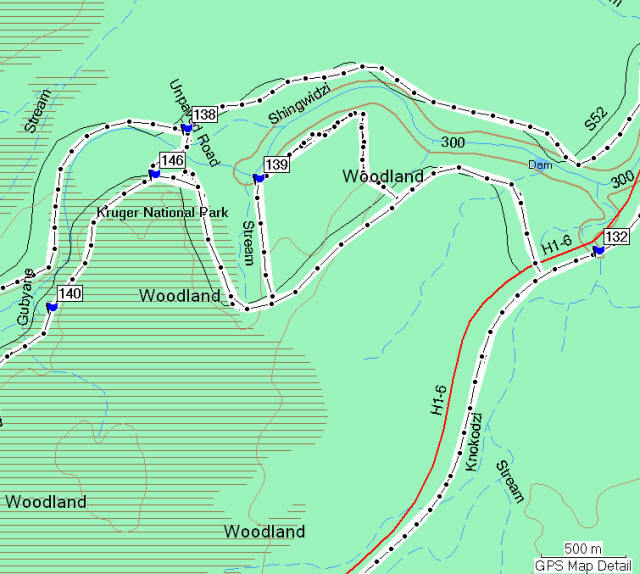 The latter half of the S52 is a loop road. This is also the road to take if you're going to stay at the Bateleur Camp (private road). Weathering of rocks and minerals occurs by 3 different processes involving any or probably all of the following : chemical, physical and biological. The biologically induced processes result in either physical or chemical reactions being speeded up in the presence of water in particular. It has been postulated that the formation of the Red Rocks was enhanced by strong biological processes involving bacteria. These geological processes have created a magnificent Red Rocks formation making the drive down the S52 all the more interesting. Similar Red Rock formations occur in a range of South African locations and are said to be the result of the Clarens Formation going back a very long time. It is quite a long drive down a sand road to complete the full loop so the section has been split into 2. The drive down to the Red Rocks covers the first section and thereafter the loop was completed driving in a clockwise direction. The roads around the Red Rocks get a bit complicated so I've created a second map in much greater detail. I certainly found it a bit confusing when I did the drive. The viewpoint for Red Rocks is waypoint 139. I approached via waypoint 138 then turned left at waypoint 146 (only marked on way back having completed the full loop clockwise. I have made the point on more than one occasion that in the Kruger National park you never know what is around the next corner. In this case luckily I found out just before I turned the corner at waypoint 137. 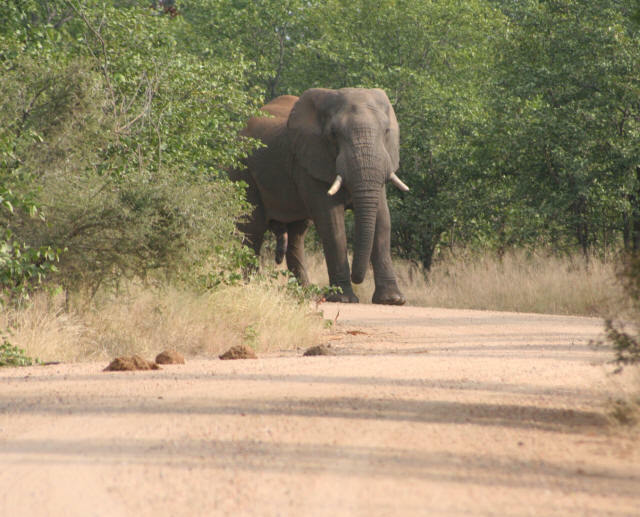 The picture is of a male or bull elephant coming in my direction. You can also see the evidence of an earlier elephant passing. 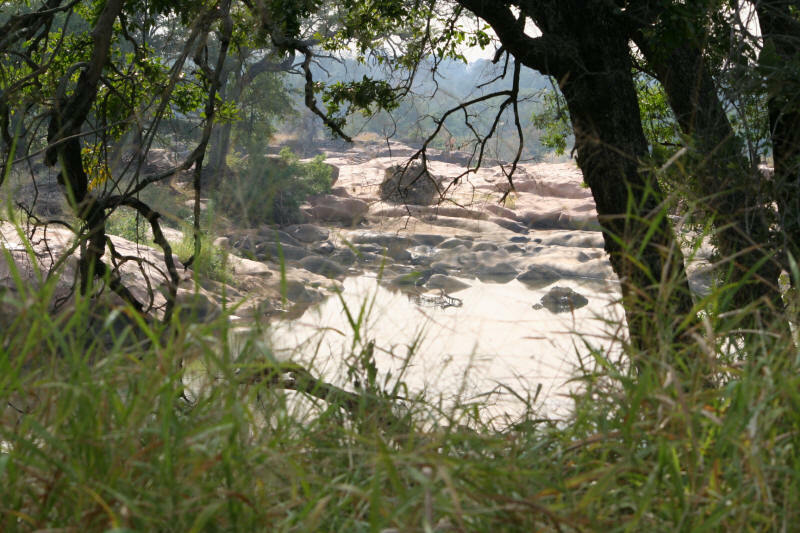 Waypoint 138 was the crossing of the Shingwedzi River. It was almost completely dry yet retained a wonderful and majestic feel about it all. This was so obviously wild Africa at its best. Evidence of a parched kind of land yet holding promise of things to come. Red Rocks (also written as Redrocks) was just around the corner and what a magnificent sight it was to be. 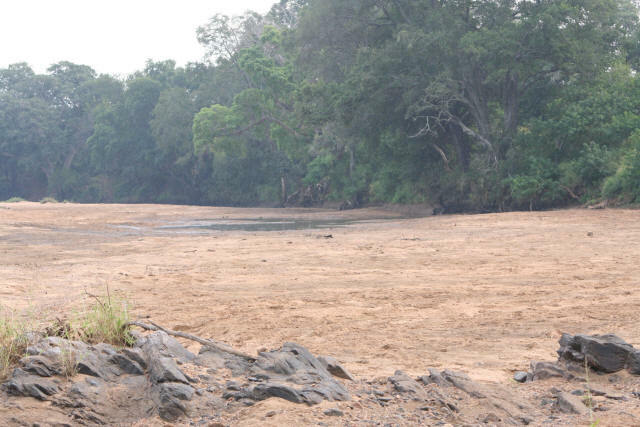 Fish get stranded in these pools as the river recedes. Look at the sweeping erosive power of the river in flood as recorded on the cliff wall. And how do those trees hang on? Red Rocks Kruger ... sandstone and water. Elephants regularly come down to drink in this area. 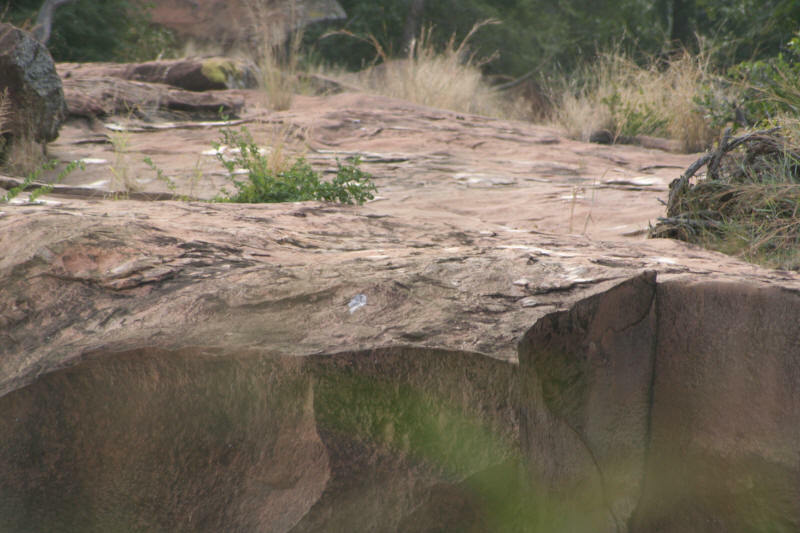 Red Rocks Kruger ... 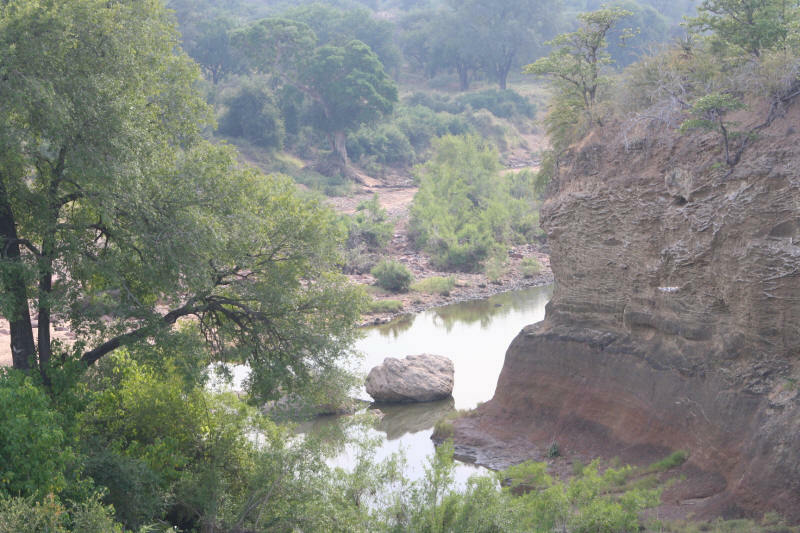 Imagine the power and erosion required to create such smooth vertical surfaces If birding is the objective of your visit to Kruger it is best to stop in different places and let the birds come to you. You will have many opportunities to do this on the Kanniedood drive and especially so since there are 2 "get out" bird hides on the route Here's the link to all Kruger birds.